A desire path in Forest Park between BJC Hospital and Steinberg Rink. Everyday, hundreds, perhaps thousands of people walk, run, bike, and skate through Forest Park. The excellent path system and the multitude of destinations make the park a great and interesting place to exercise or just take a stroll. 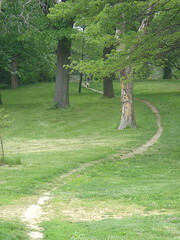 Even then, some sections of the park lack or are missing adequate paths between destinations. Two areas of Forest Park stand out from the rest—the northeast and southeast corners. The northeast corner of Forest Park has many desire paths where seemingly obvious sidewalks connections are missing. The most beaten path is on the south side of West Pine Blvd where pedestrians who wish to cross Forest Park Pkwy eschew the pedestrian bridge and head toward Grand Dr, instead. Missing, also, is any sort of pedestrian crossing of Lindell Blvd at West Pine Blvd. Strong desire paths on both sides of West Pine Blvd indicate many pedestrians use this way to cross Lindell Blvd. Lastly, it would be nice to have a sidewalk on the south side of Lindell Blvd between Union Blvd and Kinghighway Blvd to improve access and encourage greater use of the area surrounding Murphy Lake. Map showing where sidewalks are needed in the northeast corner of Forest Park. A rather egregious example of poor sidewalk access exists in the southeast corner of Forest Park. 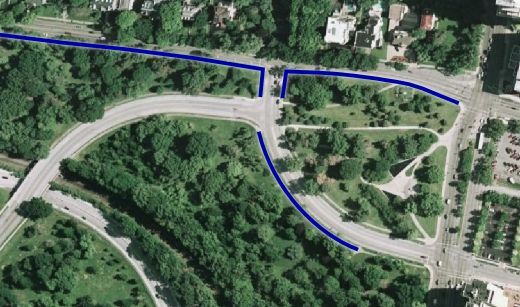 The shortest existing accessible route from the South Tower of BJC Hospital to Steinberg Rink requires a 1425 meter long walk around Hudlin Park and Jefferson Lake; with a new sidewalk, the distance could be as little as 465 meters, maybe less. In addition, the existing sidewalk between Children’s Pl and Steinberg Rink is so poorly maintained that it should be removed, immediately. A new more direct and accessible path should be built in its place roughly along the nearby desire path. There are a handful of bike commuters who use the desire path here to get to and from the hospital; a new accessible path here would make their trips faster and easier than they are now. Map showing where sidewalks are needed in the southeast corner of Forest Park. This is all true, but I think that many do not want sidewalks here. For example, the path from Steinberg to BJC is often used by hospital employees who do not want to purchase a parking pass. They park in FP and then walk. The park doesn't want to encourage this. That said, I think that each CWE street running into the park should have a prominent and quality pedestrian entrance.The Northeast corner is a mess altogether and should really be redesigned as a park for people instead of a passthrough for cars.